I received a call last week from a distraught woman. 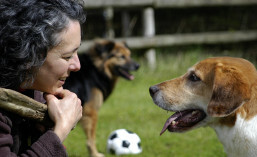 She reported that Sparky, her shepherd mix, refused to come when called. When pressed to describe situations in which this problem occurred, she said Sparky had “snuck out the door” twice, and each time had jumped the low fence to chase the neighbor’s llamas. No amount of hollering or bribes could convince him to return home. I told her this is not primarily a problem with Sparky’s recall (i.e., the behavior of coming when called). The root problem is door-dashing. Sparky certainly does need a structured training program to teach him a fast and reliable recall, but the more immediate need is to teach him to remain inside the threshold of an open door. The story of Sparky brought back a vivid memory of my zoo-keeping years–the day Georgie-girl got loose. Georgie-girl was a Pacific walrus weighing 1800 pounds, equipped with tusks and cunning. She “snuck out the door” of her chain-link enclosure by using her whiskered snout to ram the gate out of the hand of an unsuspecting novice zookeeper. She then shoved past him and waddled down the concrete path. Fortunately, this occurred behind-the-scenes and off limits to our zoo patrons. It took six hours and two live Dungeness crabs to bait Georgie-girl back into her enclosure. After Georgie-girl’s escape, the zookeepers devised a solution to prevent a reoccurrence. This plan employed a training method known as differential reinforcement of an incompatible behavior (DRI). We decided to train our two walruses to hold their whiskers against separate pieces of blue plexiglass any time a zookeeper touched the enclosure’s gate. We hung these “targets,” about the size of a laptop screen, on the fence at the walrus’s eye level, several feet from the gate. No keeper would enter or exit the enclosure until both walruses placed their snouts on a target. This targeting behavior countered the original problem behavior of ramming the gate. DRI is effective with canine chargers as well. I’ve had success using a different targeting behavior with dogs to replace their “dashing-out-the–crack-in-a-door-held–slightly-ajar” behavior. This practical alternative is targeting the carpet; that is, the dog touches all four paws to a nearby carpet whenever a human opens the door. Many homes have a change in flooring material near the front door — the entry tile changes to carpet in the living room, for example. In homes that do not have a distinct transition between substrates, a small rug can be placed at least eight feet from the front door. Targeting a carpet or rug located a safe distance from the threshold counteracts the original problem behavior of door-dashing. Initially, you can train your dog to move to the carpet any time a human touches the knob of the closed front door. Clicker in hand, click for each step the dog takes toward the carpet. Follow each click immediately with a food reward. It’s a good idea to conduct many practice trials until the dog to move instantly onto the carpet when a hand touches the doorknob. 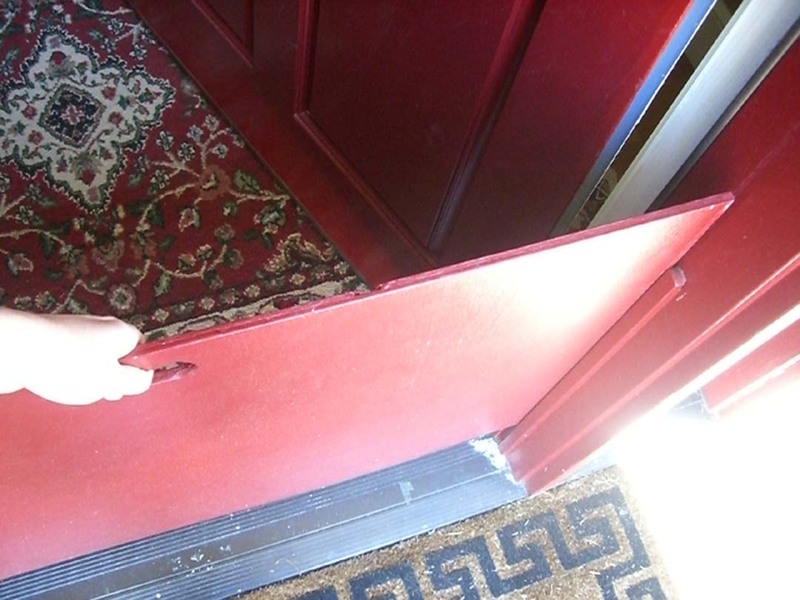 Once your dog becomes fluent in this paw-targeting behavior, you can start to open the door slightly before clicking and treating him for moving toward the carpet and away from the threshold. Over subsequent days of training, you can open the door still further. Eventually, you can add controlled distractions outside the door (e.g., a family member, a toy, another dog) to the training regime. For dogs with a history of door-dashing, it helps to begin this training at an inside door leading to another room in the house. 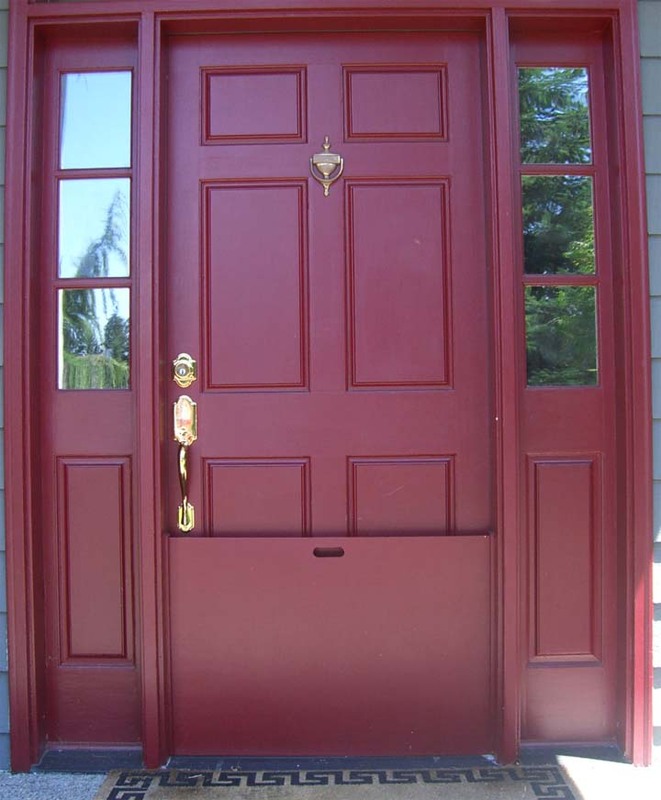 The doors to a spare bedroom or the laundry room are good practice locations. During the initial weeks of training, it is best not to use the front door except during training sessions. If that is not possible during this period, try to prevent the dog from accessing the front door when someone must enter or leave the home. Often a dog’s door-dashing behavior is unintentionally reinforced by family members chasing the dog out the door, or the dog leaping out to pursue cats, squirrels or other animals that happen to be passing by. Over time, these accidental rewards can create such persistent door-dashing that the training efforts need back-up support. Bridget, a beautiful fox terrier owned by a caring family, was a champion door-dasher. The household, which included five children, was quite busy. When Bridget was a pup, she figured out how to squeeze between the kids’ legs and bolt out the front door. She became incredibly proficient at slipping out the door. We tried to train Bridget to remain on the living room carpet when the front door was opened. Though this training helped, many different people used that door every day and occasionally, Bridget still managed to escape. Ultimately, the parents came up with an ingenious solution. They designed a stylish removable barrier that fits outside the front door. It consists of a piece of plywood, about two-feet-high, that slides down into narrow wooden channels along each side of the doorjamb. This lightweight board is painted red to match their door and has a cut-out handle that makes it easy to move. Though Bridget could jump the low barrier if she tried, she doesn’t, and the humans can walk over it easily. 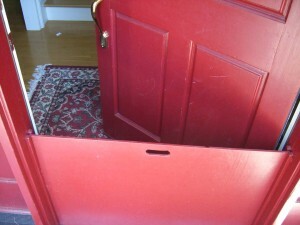 Sometimes adding a physical barrier is the safest deterrent for a determined door dasher.